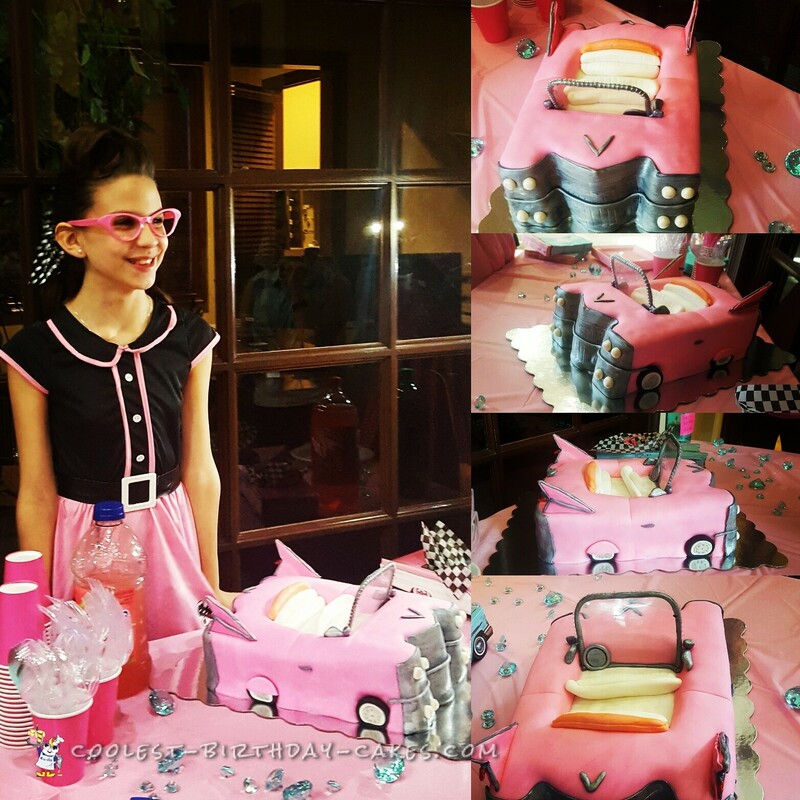 I was asked to make a 59 pink Cadillac cake for my cousin’s 13th birthday. 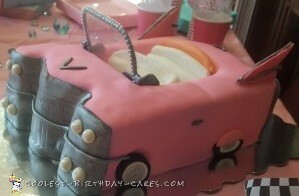 I was excited about the idea, but hesitant about how I would pull it off, having never made any car cakes before. I baked enough cake for 30 people in a half sheet pan. I made sure to tap the pan before baking to help minimize air bubbles for a more level cake surface. Once it was baked and cooled, I cut the sheet cake in half. Next, I stacked one side on top of other and sandwiched a layer of buttercream between them. Then I said a prayer and hand drew a template and carved body of cake. I used the back of my knife to make even lines for a symmetrical front and back. Then, I carved out the center in 4 even(ish) squares and crumb coated the cake. The cake then rested in the fridge while I took a 30 min break session with my toddler. Using silver luster dust, with a hint of vodka, I painted the fondant for all chrome pieces. I found that the black fondant works better with luster duster than white. I laid white fondant on top, then covered body in pink. Using a pair of scissors to cut the hole in center of the pink fondant, revealed the white underneath. I used a ball tool to create divots for headlights and small cookies cutters to make room for the tires. 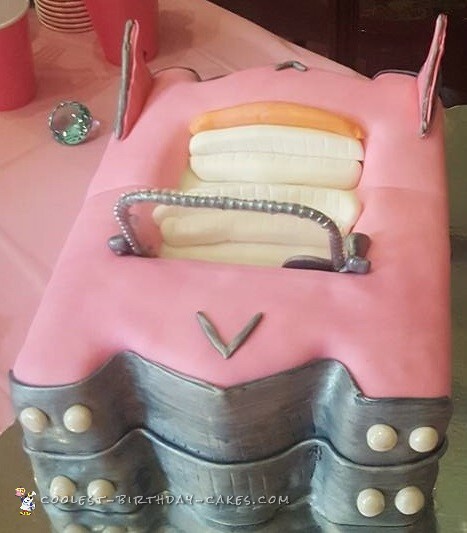 The interior of the pink Cadillac cake was fondant as well. For the tail lights and windshield, I used gum paste. To support them, I used spaghetti noodles. The glass to the windshield was a last minute idea, but I cut the lid off a to-go container which doubled as additional support. Cake was a huge success and went perfect for the party theme. There was a private theater playing the movie Grease, milk shake station, and 50s decor, but I think the car took the cake!